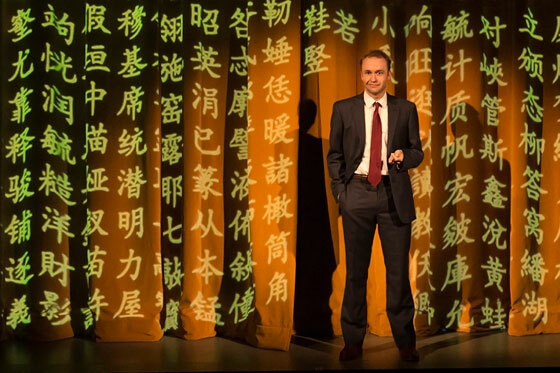 Comedy is usually not my preferred theatre genre (primarily because I don’t like slapstick humour which then crosses off a lot of comedy for me) but… Chinglish… wow it was so good! And I was so pleased it was good, though I wish we got to see Jennifer Lim play the female protagonist. While the idea they presented is not new, especially to the Hong Kong crowd, it was so well written that it came across as quite refreshing. So many plays I’ve seen over-simplify issues of race and gender or rely so much on stereotypes, that I often get really wound up, uncomfortable and offended. However, somehow, Chinglish managed to convey its ideas and character types without offending anyone, which is impressive, as it is hitting so close to home. I think it’s because it presented the views from both sides (English-speaking and Chinese-speaking) and while every character was still very much a stereotype, they were collectively used to ridicule the situations we often find ourselves in. Anyway, despite unbelievable/stereotypical characters, it was a joy to watch.The relationship between the English-speaking male protagonist and the Chinese-speaking female protagonist was a bit farfetched and there was definitely a lack of passion/emotion between them, but actually it didn’t matter. It was the humour, the pace in which lines were delivered and the misunderstandings that made the show. I loved how the writer would set up the scene by first delivering the concept verbally i.e. a character is told that Chinese are humble so long there is someone else in the room that will praise them profusely, and then that specific scenario happening in the next scene. And again later on to reinforce the effect. So funny 😀 and cleverly written. Celeste Den who played the first interpreter was hilarious. She got it spot on. We all couldn’t stop laughing. I imagine Hong Kong is the perfect audience for this show. As most people speak both languages, they get the most out of the interpretations (or mis-interpretations), have experienced Chinglish first hand, totally get the stereotypes and most importantly can catch and appreciate the subtleties. However, I do wonder what it was like for the Cantonese-only audiences. Actually, that’s one thing Hong Kong Arts Festival or the APA need to work on… the placement of the surtitle box. There was no way someone could watch the play and read the surtitles at the same time (too far off to the right and left of the stage). 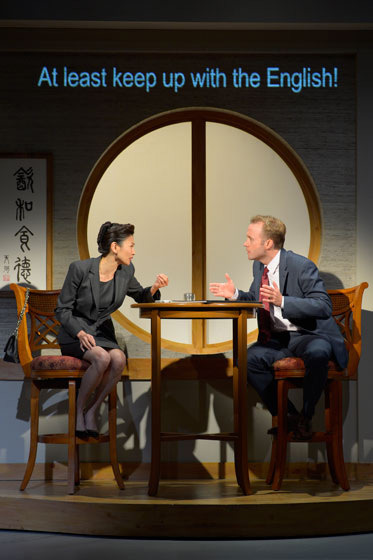 But they were really clever about the placement of the subtitling and how it was done… though that is because subtitling is integral to the play, while surtitling is an add-on for the performances in HK. I also really liked the set. Four-sided blocks on the two sides of the stage rotated to present different spaces. Scene changes were executed very snappily. And the bows were quick, as they should be. More about that another time. I would see this show again. I hope it keeps touring/finds a permanent home.